Today is Australia Day so I’m pretty excited to be sharing this lovely lamb recipe with you, not only because in my family Australia day equals eating a good deal of lamb, but because this dish, adapted from a terrific one by Nigella Lawson, pointed in my direction by my friend Amy, is all the things this blog is about: easy, tasty, affordable and delightfully do-able when having people over. Using either lamb loin or chump chops, simply place all the ingredients in a roasting dish at the same time and stick it in the oven. You don’t even need to turn anything! Just add something green to eat it with, perhaps a salad or steamed green beans, and whack the lot, straight out of the oven, onto the middle of the table with a fresh loaf of bread for mopping up the yummy juices. 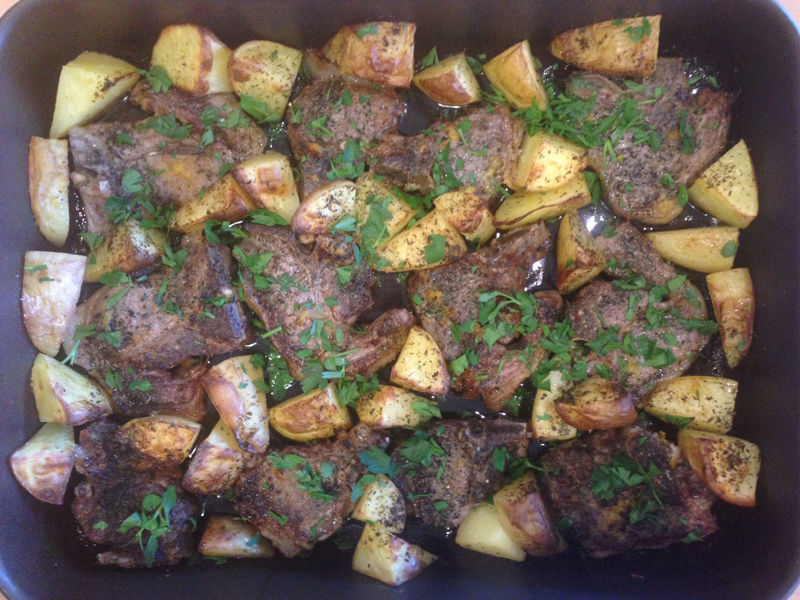 The lamb turns out oh so tenderly and the chopped fresh parsley makes the flavours come alive. This recipe is easily doubled using two roasting dishes and which can both go in the oven together – no problem: that’s 12-16 people fed for the cost of one at a nice restaurant! Even better is the fact that this delicious one-pot feast is gluten, egg, wheat and diary free. Using the quantities below, this recipe serves 6-8 and costs no more than $15 to make. Thanks for this one, Amy. 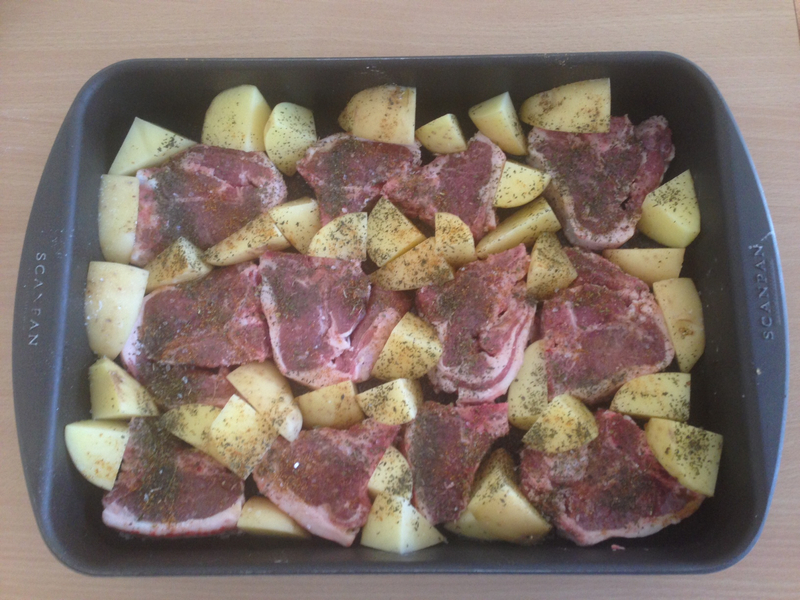 Cut clean potatoes into wedges (don’t bother peeling them) and place them in the gaps around the lamb. Drizzle the oil over the lamb and potatoes and sprinkle with the dried mint, chilli flakes and salt. Zest 1 lemon over the roasting tin and then juice both lemons and pour the juice over everything in the tray. Season well with salt and pepper and cook in the oven for 1 hour, not bothering to turn anything over. Pull the tray out of the oven when everything looks quite brown (don’t let anything burn), and if it looks like it’s very brown before the end of the cooking time, cover the tray in foil and return to the oven. Serve everything in the middle of the table for a yummy and casual feast.